Using microbes to generate electricity is not a rare discovery. In mine shafts, lakes, and even the human gut, scientists have found many strains of bacteria capable of generating electricity. Recently, a team of scientists in the US have also discovered a cluster of such bacteria in their country’s Yellowstone National Park. These bacteria, which reside in the park’s alkaline hot springs with temperatures ranging from 43-93°C, have unique characteristics that make them very valuable in the development of microbial fuel cells. Microbial fuel cells, which use metabolic activities of microbes to produce electricity, continue to attract the attention of scientists because they promise to simultaneously solve environmental pollutions and provide a new source of renewable electricity. If the working mechanism of this technology is more properly understood, then it is possible to draw from the infinite supply of bacteria to produce electricity for various applications. Some of the heat-loving bacteria that were recently collected by a team of scientists from Washington State University (WSU) in Heart Lake Geyser Basin of the Yellowstone National Park are able to consume toxic pollutants and convert them into less harmful substances as they generate electricity. The WSU team said that they had to collect and study these bacteria in situ because replicating the same hot spring ecosystem in a laboratory setting would be too difficult. Normally, scientists studying electricity-generating bacteria insert electrodes directly into containers that hold the culture medium and the bacteria that are being investigated. The bacteria would be able to “breathe” electricity through the electrodes. The members of the WSU team caught their bacteria using a similar method. They placed several electrodes in the water of several hot springs. Each set of electrodes was connected to a potentiostat that is specially built to withstand the conditions of the hot spring environment. The electrodes were taken out after submerging in the water for 32 days and examined for the presence of electricity-generating bacteria. The WSU team found that the heat-loving bacteria are able to pass electric currents through the solid carbon surface of the electrodes. Haluk Beyenal, a professor in the School of Chemical Engineering and Bioegineering at WSU and one of the supervisors of the team, said that these bacteria send electrons to surfaces of metals and minerals via the respiration process. He also noted that the electric currents that they create are suitable for low-power applications. 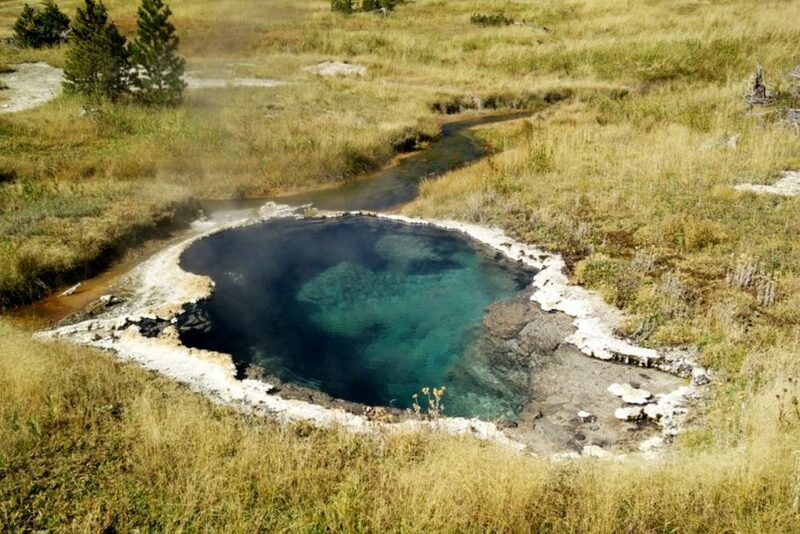 The discovery in Yellowstone was also the first time that electricity-generating bacteria were found in the extreme environment of an alkaline hot spring. For the WSU team, the search for this kind of microbes is not simply driven by academic interest. Because these organisms can break down toxic substances and produce electricity at the same time, they may play a key role in controlling pollutions and opening a new path in the development of renewable energies. The scope of applications for bacteria and microbes in power generation is quite broad (and not necessarily related to the microbial fuel cell technology). For example, researchers at the University of British Columbia in Canada have turned the notorious E. coli bacteria into a valuable material for organic solar cells. Their solution involves altering the genes of E. coli bacteria so that they produce more lycopene – a photoactive material. The genetically modified bacteria are then coated with nanoparticles of titanium dioxide to become a kind of semiconductor that can be applied to a glass surface and generate electricity under sunlight. Another interesting example comes from Binghamton University in the US. Researchers there successfully developed a single-use battery that is made of paper and relies on the symbiotic relationship between two kinds of bacteria to create electric currents. When the battery reaches the end of its life, the bacteria in it will help break down its paper-based construction and thus solving the problem of its disposal. While it is still too early to predict whether people will be able to effectively harness different types bacteria to generate electricity for various purposes, many academic and private research organizations are aggressively exploring all possibilities within this field. The commercialization of microbial fuel cells in the future will therefore depend on the progress made in the overall R&D.